Most places that I’ve traveled to, the concrete has taken me there. And when I’ve returned, sometimes, it’s been because of the concrete. And, sometimes, it’s been ‘cause of the people. And, sometimes, it’s been because of the concrete and the people. 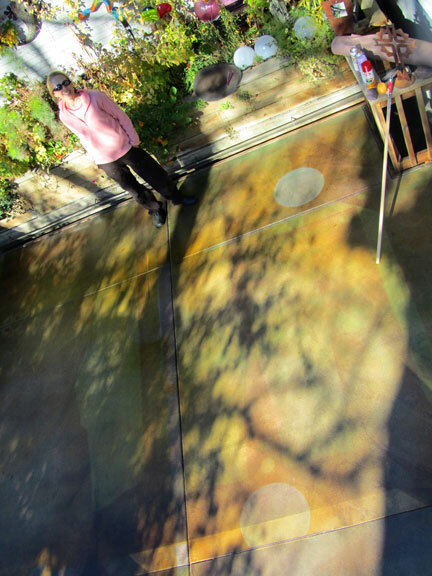 Recent client, Teresa Lower, of Casper, WY, can’t resist relaxing on her lower patio, composed of variegated stained and dyed, on-grade cast-in-place and pre-cast circular elements. Art Boatright, president of ready mix producer, Mobile Concrete, our first patron in Casper. 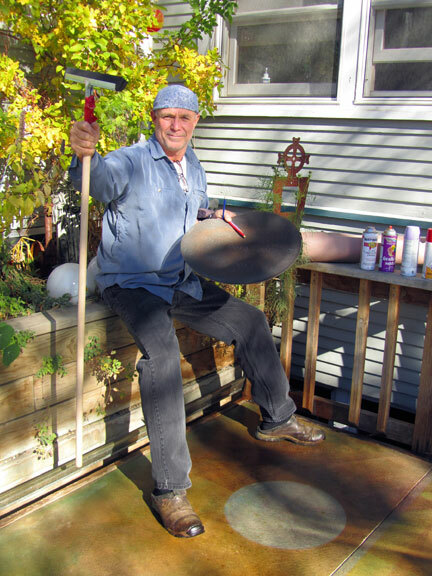 Here, Art is posing with an art panel of applied dyes and stains over skim, imbedded and embedded with found objects. We first visited Casper, and worked with Art,in the late 90’s. He looked like Drew Carey then, and, he still does… Hasn’t aged one bit!!! Just east of The Cascades, between Ellensburg, Washington and Yakima, is one of those places. 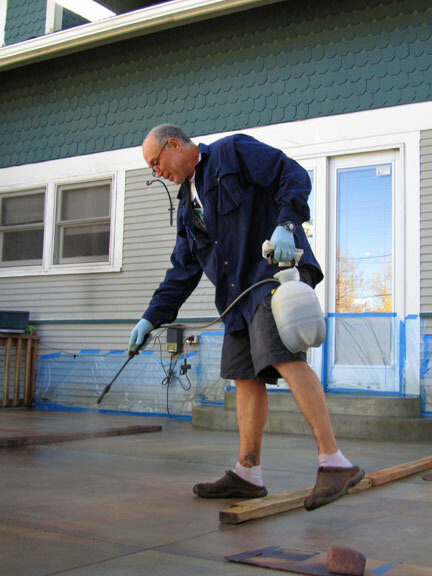 As the concretist, we’ve worked both internationally and nationwide. You might find us working just about anywhere… But, we’ve done more jobs, in a 30 mile radius, between Ellensburg and Yakima, than just about anywhere… And, believe me, this is no major population center… But, the concrete there has been sweet, and the people have been warm, while the weather has often been not so warm. We love this place! The Washington wine country. An art panel of applied dyes and stains over skim, imbedded and embedded with found objects. I’ve just been back to another such place, where my fondest sensory concrete and personal memories mingle. We haven’t done quite as many jobs in Casper, Wyoming as in central Washington state, but, we’ve done enough. The weather is just about the same in this part of Wyoming as in that part of Washington, perhaps a bit colder in the winter? The population is similarly sparse, perhaps even a bit sparser? But, the concrete and the people, they can’t be beat! They love their concrete in Casper, and they know how to do it right. 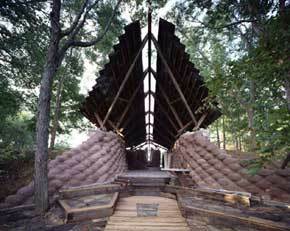 And people who love concrete, well, those are my kind of people!!! 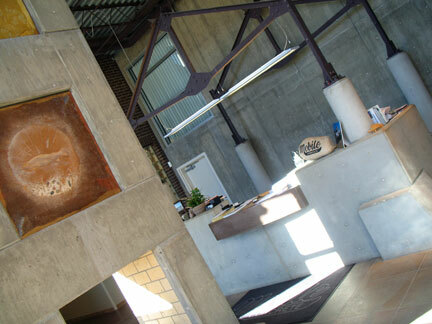 Our client, ready mix producer, Mobile Concrete’s offices, Casper, Wyoming Concrete elements include… Cast-in-Place: natural gray walls with brown pigmented reception desk, dyed and patina-stained saw-cut suspended slab. 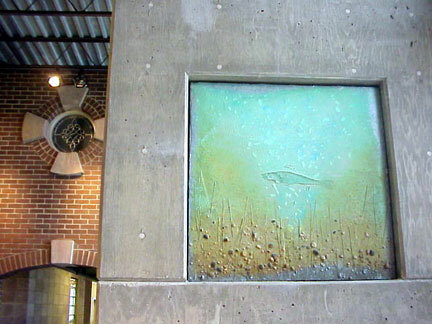 Pre-Cast: dyed and patina-stained, skimmed cement-board, art panels, imbedded and embedded with found objects from the North Platte River (this runs through their property), such as grasses, pebbles, and even a fat brown trout! 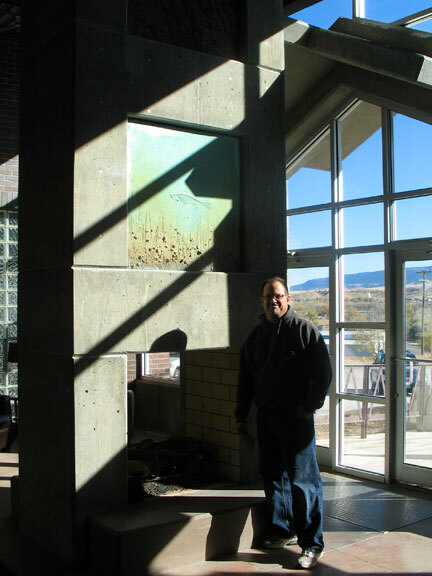 Pre-Cast Elements: dyed and patina-stained, skimmed cement-board, art panels, imbedded and embedded with found objects from the North Platte River (this runs through their property), such as grasses, pebbles, and even a fat brown trout! 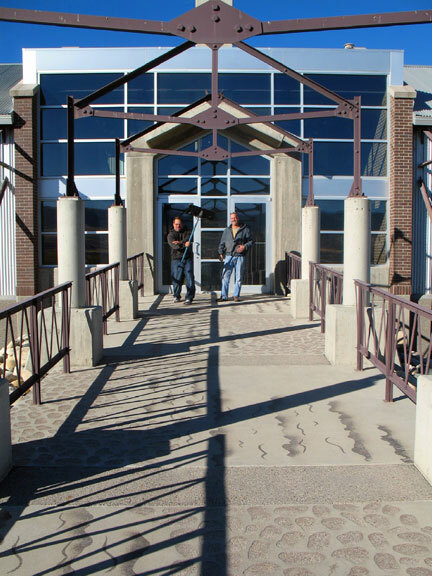 On left, Art Boatright, president of Mobile Concrete, our first patron in Casper, and, on right, smilin’ Bob Lower, Structural Engineer, Art’s associate, good friend and neighbor, and, our most recent patron in Casper. Here, the boys are posing with an on-grade, cast-in-place, natural gray sidewalk, which was subsequently sealed, then sand-blasted through a plasma-cut steel template. Blasted graphic was based on aggregate shapes, ancient alluvial deposits, from Mobile’s quarries, with the very occasional stray leaf and rattlesnake, thrown in for fun and shock-value. Where sealer (acting as a resist) was blasted away, the graphic was subsequently patina stained. This sidewalk is now 12 years old. And this is what we did… The bulk of the slabs were patina-stained and dye-washed in a variegated “irony” (as is iron-y, not ironic) purple brown, with Ironite spotting. These were similar and color to an old rusted railroad trestle. We filled the ho-hum square voids in the fireplace with art panels, which were also stained and dyed over Sgraffino-skimmed cement board. The Sgraffino was imbedded and embedded with found objects from the North Platte River, such as grasses, pebbles, and even a fat brown trout! The fish were caught in the river and placed in the wet Sgraffino overlay. Slime on the fish acts as its own release agent. Wait ’til the next day, when the skim is hard, and the fish are easily removed. Scales and all details are perfect, like a Japanese fish print! If they were removed earlier (as in a stamp), the details are smudged and not crisp. Hence, this is an hybrid application (typical concretist fare), where the fish are impressed like a stamp, but, left in place until the mud is hard, more like a form-liner. Same is true with the grasses. They were harvested from the river bank, scattered on the wet mud, impressed, and, removed the next day. Pebbles were from the river’s edge, and were inlayed, and left in place permanently. The two-foot grid, on the lobby floor, at the base of the fireplace, was stained and dyed in much brighter and more saturated colors: reds, oranges and yellows. The occasional corner was flashed with a shading lacquer, containing metallic pigments. 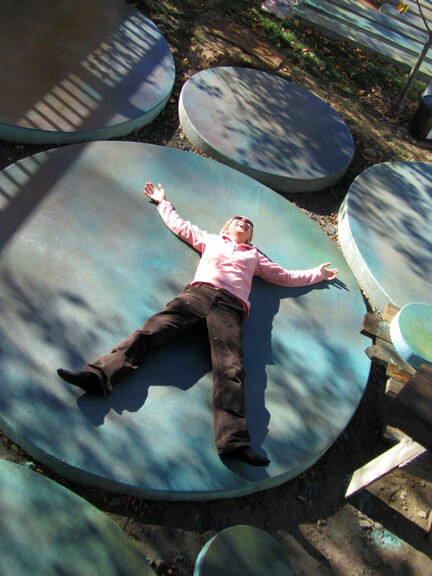 Flashback to The Late 90’s: Dana, the concretist, plasma-cutting steel template. As for the front sidewalk… We sealed the on-grade, cast-in-place, natural gray sidewalk, with a solvent-based acrylic (which would also, later, act as a resist). 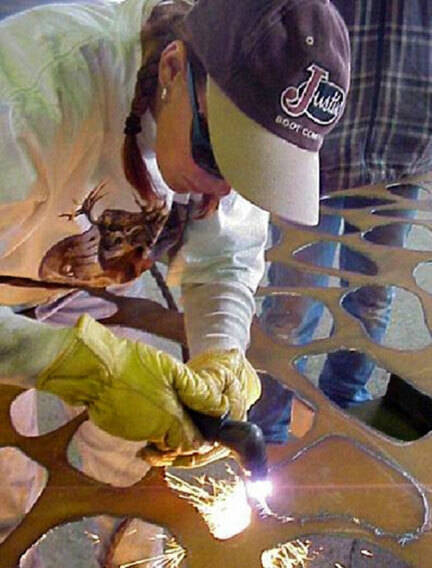 We then sand-blasted through a plasma-cut steel template. Blasted graphic was based on aggregate shapes, ancient alluvial deposits, from Mobile’s quarries, with the very occasional stray leaf and rattlesnake, thrown in for fun and shock-value. Where sealer (acting as a resist) was blasted away, the graphic was subsequently patina stained. 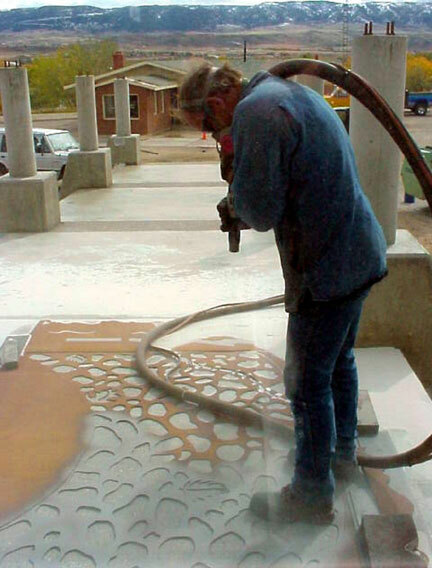 Another Flashback… The Late 90’s: Eric, Mobile Concretist, sand-blasting graphics, with steel template. We’ve been back to Wyoming several times since the 90’s. Once to visit Yellowstone and Jackson Hole, with Art and his wife, Lynette. Once to stain floors and walls for a new Boys Club. And once with our youngest daughter, and her boyfriend, who was attending college in Laramie at the time, for a blizzardy Thanksgiving with The Boatrights. 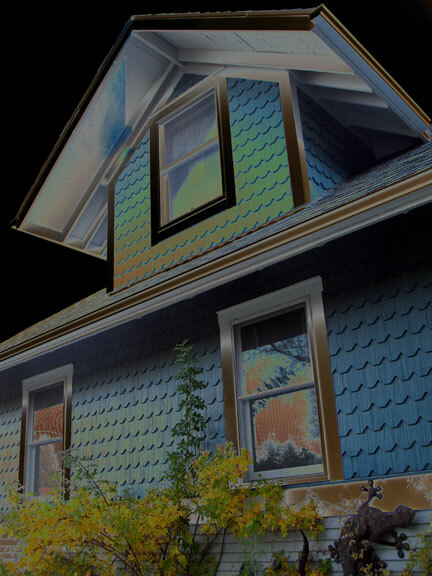 The Lower’s residence is photographed and digitally altered (solarized), with PhotoShop, to develop palette ideas for patios, stairs and sidewalks. Upper patio was first patina-stained. It was then layered with multiple dye-washes, using found objects (crosses, rocks from the garden), recycled form boards, scrap lumber, even used sanding screens, as templates. Upper patio was first patina-stained. It was then layered with multiple dye-washes, using recycled form boards, scrap lumber, used sanding screens, and even rocks from the garden, as templates. Found objects as templates? Templates of crosses? 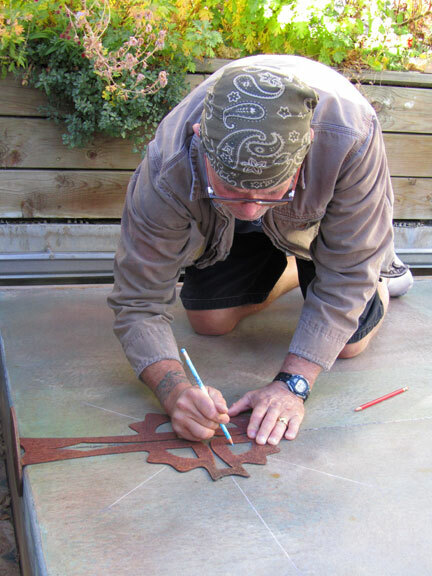 Mike uses found object as inspiration, a template and as a simple mechanical guide. Upper patio was first patina-stained and spotted with Ironite fertilizer granules. It was then layered with multiple dye-washes. 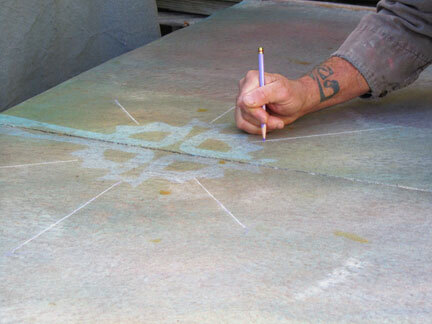 Here, concretist fleshes-out this cross graphic, with a straight-edge and carbide-tipped scribe, which is subsequently in-filled with colored pencil. 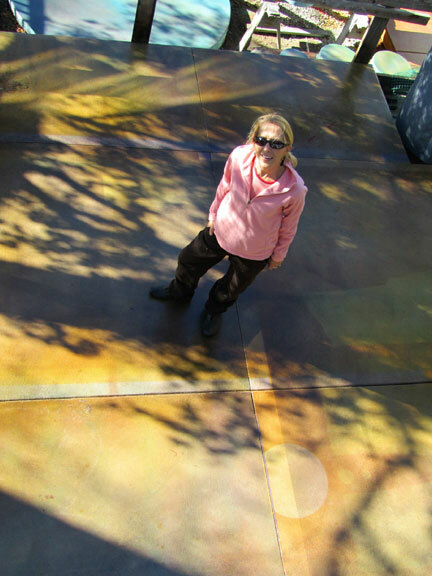 Client, Teresa Lower, is pretty in pink, on layered and graphic, suspended cast-in-place, upper patio. Here, Teresa is pretty in pink, on layered and graphic, suspended cast-in-place, upper patio. 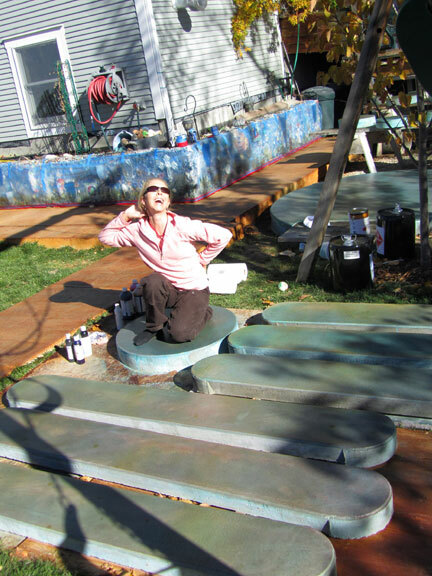 And, finally, client, Teresa, can’t resist posing on her variegated stained and dyed, circular lower patio and pre-cast stair elements. I’ll look forward to returning to Casper again! Perhaps in the spring or summer, for a change? To float and fish The North Platte, to check-out the Lowers and the Boatrights, and their concretes, and, what’s fresh from their gardens and what the gals will create with it! 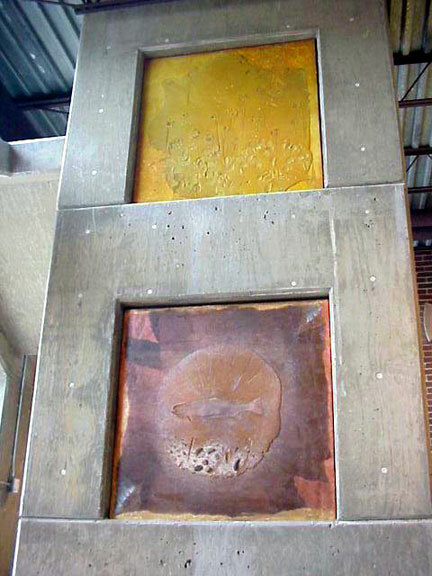 This entry was posted on Monday, November 8th, 2010 at 5:19 am and is filed under Artisan-Applied Finishes, Concept Develoment & Design, Consulting Services, Graphics & Fine Art, Installations, Kindred Spirits, Sensory Concrete. You can follow any responses to this entry through the RSS 2.0 feed. You can leave a response, or trackback from your own site. Loved this entry on your website Mike! We miss you but are glad you left us with great memories and further evidence of your ability to beautify the grey stuff! We love you.. the Boatright family. The article is great! Thank you for including it on your site, it’s fun to see our house there. Hope you have a happy new year and we look forward to seeing you again. Theresa thinks that she could be modeling Carharts professionally.